Young, active bodies need the right nutrients to stay vibrant and strong. Here's a guide. Getting children involved in sport not only develops skills and coordination, gives them a sense of accomplishment, builds healthy bodies and encourages healthy self-esteem – it also helps to put nutrition on their radar. Whether children do a sporting activity after school or play sport at the weekend, giving active bodies the right fuel can help them perform well, recover quickly, restock their energy stores and stay hydrated. The nutrients that children consume today are the foundation for a strong and active future life, used to build their skeleton, muscles, organs, nerves, hormones, enzymes and blood. It’s great to involve kids in packing lunch boxes for sporting days. Explaining to them the nutrients that active bodies need, and how healthy foods boost their performance can capture their interest and get them excited about making healthy food choices. 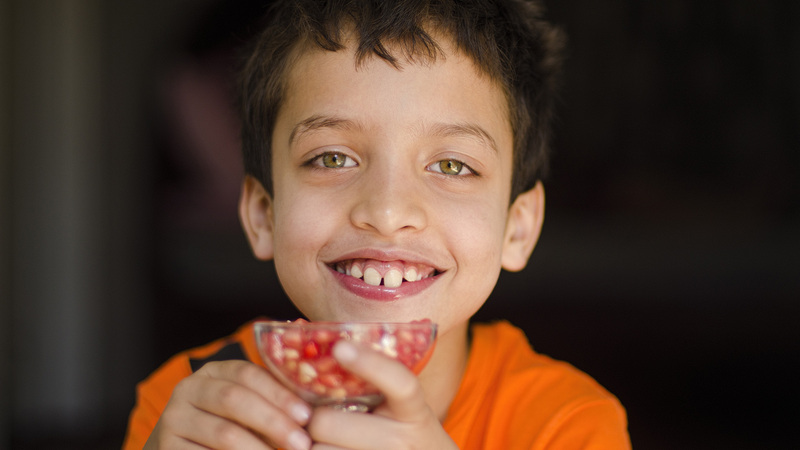 Here are the essential elements of a healthy diet for active kids. Carbohydrate, fat and protein fuel the body for growth, quick bursts of activity and endurance activities. Muscles use glucose first as an energy source so good quality carbohydrates (eg wholegrain breads, cereals, pasta, brown rice) help to stock up the muscles ready for activity. Protein foods (meat, chicken, fish, eggs, soy, nuts, legumes) are used to build body tissues such as muscles and bones. Fats form the basis of our brains and every cell in the body, so good fats (avocado, nuts, seeds, oils, oily fish) are essential. However, as fat takes longer to digest, avoid eating high fat foods just before an event. Protein, calcium, magnesium, vitamin D and phosphorus are essential nutrients for strong bones and teeth. Vitamin D is made by our bodies when skin is exposed to sunlight, while dairy foods are a rich source of the other bone building nutrients. In order to build healthy red blood cells which can meet the demand for increased oxygen when we exercise, we need to be getting enough iron, found in meat, (especially red meat), eggs and iron fortified cereals. Vitamin B12 (found in animal products including dairy foods) and folate (found in leafy green vegetables) are also important. Replacing fluids while exercising is a priority to help keep us cool and prevent dehydration, which impairs mental and physical performance. Fruit and vegetables are nutrient powerhouses, with the fibre, antioxidants, vitamins and minerals essential for healthy bodies. 1. Base meals on carbohydrates such as oats or high fibre cereals, wholegrain bread/crackers, rice, pasta, couscous, quinoa, potato or sweet potato. 2. Add protein in the form of dairy (milk or yoghurt on cereal or between meals, cheese as a snack or on toast), eggs, meat, chicken, fish, legumes (baked beans, chickpeas) or nuts. Remember to include oily fish and red meat. 3. Getting in two serves of fruit and five vegetables takes some creativity. Fruit is a great snack – mix it with yoghurt or slice it on to cereal. Grate extra vegetables into pasta sauces, meatballs, and rice dishes, or chop up some carrot, capsicum and cucumber strips for a snack with hummus, beetroot or pesto dips. 4. If your child is active and a healthy weight, save extra treats and snacks for special occasions. Fuel them well to help them grow strong and healthy, build capacity and endurance – and prevent them turning into little hungry monsters on the drive home after sport.